When Emma was born, I started a journal. We were told her life would be short so I felt an urgency to record her days so I would remember the little things. I wrote it as a letter to her but I read it often. I find things that I forgot and I treasure those little tidbits of lost memories. I was reading it recently and I found a paragraph that was written when she was about a year old. In it I talked about healing and what that had come to mean to me. I remember shortly after Emma's birth, while she was still in the NICU, we met a lady who gave me a "prayer book" full of prayers to read over Emma. She said that if I had enough faith, Emma would be healed. I remember looking at it and then throwing it in the trash. Part of me wanted to believe that reading a few prayers over her would make everything all better. I would have read all night and all day for as long as it took if I really believed that was the answer. But I knew in my heart that chanting scripture and prayers doesn't make life the way we want it to be at all. I guess I am too much of a realist because I knew that Emma's life had been set in motion by someone bigger than me and He had made her exactly the way she was. I believed He had the power to heal her but I knew that there was a reason she was made the way she was. I could not change that with any amount of prayers. So, I accepted it and moved on. Don't get me wrong, I didn't like it. I cried. I pleaded. I fell apart on numerous occasions. But I always picked up the pieces and kept going. There was no other choice. Somewhere along the way, though, I began to change. I realized that maybe Emma wasn't the one who needed the healing. Maybe it was me. Maybe I was so caught up in what the world labeled as whole or good or acceptable that I had missed the perfect gift that God had given to me. 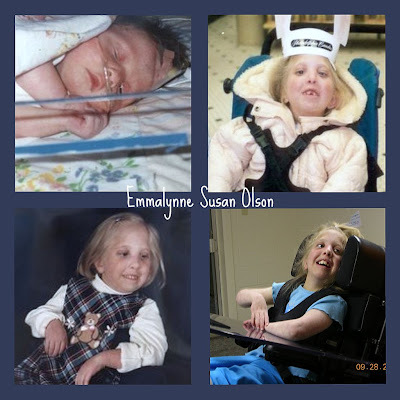 I began to see Emma's life as a miracle. I began to look at her and see this perfect creation of God's that had been given to me to love and hold and look after and I started to pray, "God, heal me.". I wanted to let go of the narrow view of perfection of this world. I wanted to see all of the miracles God had placed in my path. I wondered what I had missed already. I wish that this world could change its perspective. I wish that people would see the potential of those around them. I wish they would look at others through God's eyes of grace. I know they would see so many beautiful miracles. The world would be a better place. I am so grateful for the gift of Emma. She just keeps on giving. Wow.. isn't that the truth!! Thank you for that.. I know that there are alot of times I need healed also!! Thanks Stacey for that great post!! ps. I can't believe Anna is "1" already!!! This post is so beautiful. thank you. I pray that the Lord heals me as well.